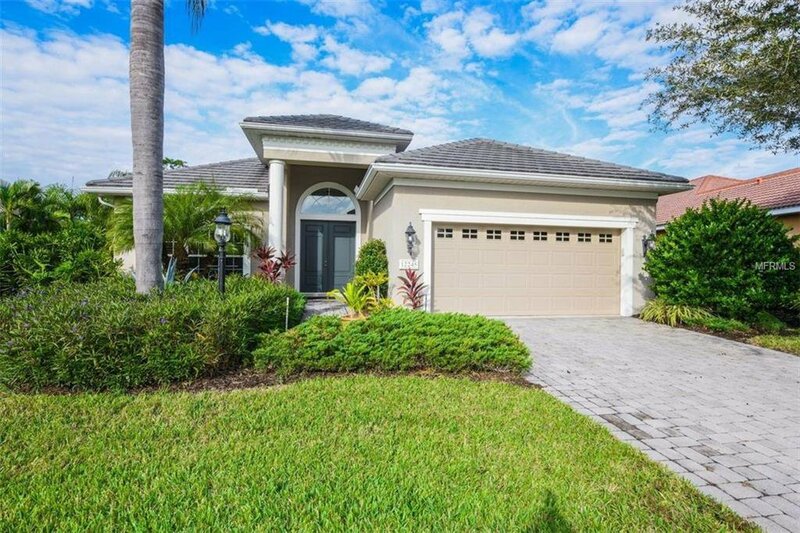 Don't miss the spectacular lifestyle offered by this immaculate home in the gated community of Lakewood Ranch Country Club. Freshly painted interior, new carpet & upgraded padding in bedrooms. Designer details are visible throughout this 2 bedroom plus den home (or 3rd bedroom) and include an open plan with formal dining, plantation shutters, window treatments, extensive crown moldings, decorative fans & light fixtures as well as neutral tile set on a diagonal throughout the living areas. The luxurious master retreat features a tray ceiling with walk-in closet while the master bathroom offers separate vanities and a spacious walk-in shower. The kitchen boasts white cabinetry, corian counter tops, subway tile backsplash, pantry, breakfast bar & separate dinette area. Enjoy the private preserve setting from your Great room with sliders as you step out to the picturesque and expansive heated and self-cleaning salt water pool with water feature and and covered paver lanai surrounded by lush landscaping...perfect for entertaining family and friends. Home offers double pane windows and a new A/C unit was installed in 2017 as well as a new refrigerator & washer. The Thornhill neighborhood offers maintenance-free living and is located within the heart of Lakewood Ranch...great restaurants, private & public golf courses, athletic centers with tennis, fitness and aquatics, hospital, medical center and shopping, including the fabulous LWR Main Street and just minutes away from the new Mall at University Town Center.